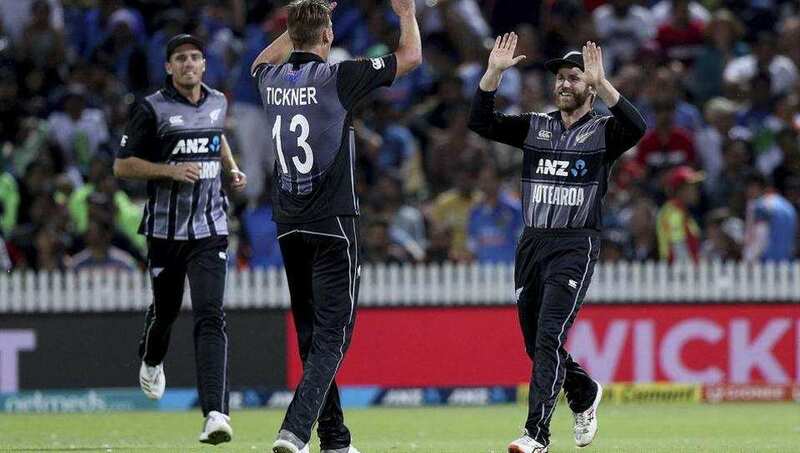 India vs New Zealand 3rd T20I Highlights: New Zealand set India a target 213 to chase and the visitors ended their innings on 208/5. India vs New Zealand 3rd T20I Highlights: Colin Munro’s whirlwind 72 off 40 balls powered New Zealand to a total of 212/4 on a batsman’s pitch. India were dealt an early blow when they lost opener Shikhar Dhawan in the first over. While the visitors maintained a good run rate, frequent loss of wickets added pressure and eventually, they fell four runs short of the target. This is the second time India are losing a bilateral T20I series in New Zealand. Colin Munro is Man of the Match and Tim Seifert is man of the series. Rohit Sharma: Disappointing to not cross the line but we fought well right till the end. 210 odd was always going to be tough, but we were in it till the end, they held their nerve and kept hitting their yorkers. Lot of positives, we started well with the ODIs, wanted to do well here but the boys throughout the tour were excellent, put in a lot of hard work. They will b disappointed tonight but we’ve to learn from the mistakes we made from the tour and move ahead. Would’ve nice to fly back with a series win, but yes, lot of positives through the tour, looking forward to heading home and playing Australia. Tim Southee bowled it and it was nothing like his previous over. The first ball was whipped by Karthik down long-on but stopped from doint too much damage brilliantly by Santner. Two runs came out of it and then the second and third balls were dots, with Karthik refusing to run off the latter despite Krunal almost reaching the other end. 14 needed off the last 3, DK took it upon himself. Unfortunately for him, it did not quite come off, he could only manage a single off the next ball. An improbable 13 needed off the last two and that became impossible when only another single came off the penultimate ball. Southee bowled a wide after that and Karthik hit a six off the last ball to end an incredible match. Quite an eventful final over which Dinesh Karthik ends with a six. But India are four runs behind the target; they finish on 208/6 and New Zealand win the series 2-1. KRUNAL PANDYA GOES DOWNTOWN OFF THE LAST BALL OF THE 19TH OVER. India need 16 to win off the last over. 19th over Kuggeleijn the bowler, first ball dot, single off the second ball and then Karthik creams a short delivery to the offside for six. 23 needed off 9. 18 runs taken off that over by Krunal and Karthik. India’s deficit has reduced to 30 off the last two overs. The first ball was a wide, the second ball deposited to the stands by Krunal, the third is a lucky four and the fourth is an intentional one. India need 33 to win off 15. DK and Krunal are in the middle, Tim Southee has the ball in his hands. The Kiwis will know that one more wicket shout do the trick. At the same time, 48 needed off 18 has never been an impossible equation in T20 cricket. He first hit Mitchell for a maximum over deep square and then sends Tickner over long off in the next over. Krunal and Karthik have done it multiple times for their respective IPL teams. 49 needed off 20. Dhoni goes back over the bowler’s head but it has the lungs to go up and not the distance. Southee is underneath it and holds on to it. A good catch, that, it went miles in the air. Hardik Pandya goes for a wild slash, his bat goes flying to the offside and the ball goes straight down the throat of Williamson mid-off. He is replaced by Dinesh Karthik. India 145/5. Daryl Mitchell gets the biggie! Rohit Sharma goes for one slog too many, chases a wide one outside off and nicks it behind. Is that the match? There is still Dhoni and Krunal to come. He is a simple man Hardik Pandya, he sees a short ball, he pulls it over deep midwicket into the stands. No need to set your sights in. India 128/3 off 13 overs. The pressure gets to him and he creams a full toss straight to Williamson at midwicket. Blair Tickner has his first international wicket. After that Pant burst, the Kiwis apply the breaks. Tickner and Mitchell bowled the 11th and 12th overs respectively and it yielded a total of just 12 runs. He replaces Vijay Shankar and hits a four and a six off the first two balls he faces. He then hits two sixes in the next over off Sodhi. India 108/2 off 10 overs. Vijay Shankar, first over off side, then to leg. Those are the first sixes of the innings. He almost nicked behind at the end of that over but India won’t care too much about that. That was the seventh over bowled by Mitchell Santner. He kept out of Rohit Sharma’s comfort zone as much as possible, even bowling a wide outside off, Vijay tried to hit a six off the last ball, it didn’t even reach the boundary and only yielded a single. Rohit Sharma steps down the track and smashes Tim Southee for a four through mid-off and then follows that up with a nudge fine that runs to the boundary again. The debutant had a go in the fourth over and Rohit Sharma was almost run out by Kane Williamson off the first ball. The third ball shaped away late and beat Vijay Shankar. Then the batsmen ran two before Tickner bounced one about two feet over Vijay’s head. The penultimate ball was hit fir a four and then a single, India 38/1. Vijay Shankar with two fours in that over and that means India have taken 11 runs from the third. They need more of these if they are to pull this off. DHAWAN DOES NOT LAST AN OVER! He hit a four off the second ball he faced and is dismissed off the fifth of the over. Dhawan looking for a slog sweep, ends up hitting it towards Mitchell at deep midwicket who dives forward to complete the catch. India will have to break the record for their highest succesfull run chase in T20 Internationals to win this match. The previous one was Mohali 2011 when India chased down a target 207 set by Sri Lanka. 12 runs were scored off that last over. 200 an absolute minimum, is what Simon Doull had said before that match. Well, the Kiwis have crossed that bare minimum and believe it or not, it looked they would get at least 30 runs more at one point. One over to go in the innings, Khaleel has the ball in his hand, Ross Taylor on strike. De Grandhomme goes after a wide and full delivery outside off, ends up nicking it Dhoni. Back to back fours off the first two balls of the 17th over but after that, Bhuvneshwar restricts the two batsmen to singles. Except for the last ball that is, which was a full toss that Daryl Mitchell drives on the up over the bowler’s head for four. De Grandhomme joins the party. He was the only one who looked slightly comfortable among the New Zealand batsmen in Auckland and he can hit the ball hard. That is the first six hit by a batsman who is not named Munro or Seifert. And it is Hardik who takes the catch! Munro can’t get enough distance on it this time and Pandya takes an easy catch at deep midwicket. The drop off the first ball and then 14 runs off the next three that Munro faces, one of which was a four that was gifted by India due to shoddy fielding. KHALEEL DROPS A DOLLY! Hardik with a slower delivery that Munro half-heartedly tries to pull, the ball balloons to backward square leg where the ball pops right out Khaleel’s hands. Munro brings up his 50 and New Zealand’s 100 with his fourth six of the innings. There was a stumping appeal against Williamson off the last ball of the 10th over but this time, the batsman had made his ground. Just four runs given away as Krunal somewhat makes amends for his previous over. Kane Williamson is in the middle now and New Zealand won’t mind if the run rate slows down a tad bit for the next few balls. Dhoni’s flash hands in action behind the stumps, Kuldeep Yadav gets the breakthrough. Replays, though, showed that it was a borderline case and it looked like Seifert had made his ground but the third umpire thinks different. Incredible work as usual by Dhoni behind the stumps, New Zealand lose their first in the 8th over at the end of which the score is 83/1. 20 runs smashed off the elded Pandya’s first over of the match. Munro smashes a six and a four, takes a single and then Seifert hits a maximum. New Zealand race past 50. Seifert miscued a shot for the cover and ended up lofting it over point, Vijay Shankar had to run a fair distance and then go for a full stretch dive to take the catch. He does all of that and still, the ball slips out his hands. That would have been an astonishing catch had he managed to hold on. The next ball is attempted yorker and Seifert extraordinarily laps it up and pushes it over short-fine hockey style for six. New Zealand 38/0 after that rock’n’rolla over. Four proper yorkers by Bhuvneshwar Kumar in the third over and just three runs came off it. One of those was a wide that he bowled after he had to stop midway through his stride due to a fly going in his eye. The openers would be happy that they have seen off Bhuvneshwar, up next is Khaleel. India vs New Zealand 3rd T20I Highlights: Throughout the twin tour of Australia and New Zealand, India have thrived on resilience. After losing the second Test in Australia and surrendering the advantage, they bounced back to win at the MCG and went on to take the rubber. Then, after losing the first ODI in Sydney, they rallied to win the next two matches to annex the trophy.